Almost 107 years ago, one of the most famous and deadliest disasters took place. On April 15th, 1912 at 2:20 a.m., the Titanic, deemed to be the luxurious unsinkable ship for the elite class hit an iceberg and sunk at the coast of Newfoundland taking down with it more than 1,500 lives. This event has proven to be quite a historic day in the timeline of mankind and people still get chills when they witness anything related to the Titanic and the tragedy on that fateful day. With that in mind, here are 12 secret facts about the RMS Titanic ship that you might not know. In the year 1894 (14 years before the ship set sail), Morgan Robertson wrote a novella titled “The Wreck of the Titan: Or, Futility”. This was a novella about a fictional ocean liner that was thought to be unsinkable but sinks after a collision with an iceberg. The similarities are uncanny, right? Did you know the collision could have been avoided altogether if the iceberg was spotted 30 seconds earlier? Why wasn’t it spotted? It was because no one had access to binoculars. At the end moment, the ship’s second officer was replaced and he forgot to hand over the key to the locked room that housed the binoculars. Milton S. Hershey, Hershey’s chocolate founder had a ticket but he chose not to board the shop. Guglielmo Marconi, the inventor of the telegraph was given a free ticket but instead opted for the Lusitania. P. Morgan had his own private suite on the ship but cancelled it at the end moment to remain in France. Theodore Dreiser, an American novelist also planned to board the RMS Titanic ship, but he was talked out of it by an English publisher who advised him to take a cheaper boat. Ballard was hired by the U.S. government to take part in a secret mission where he had to use the underwater robot he invented to find two nuclear submarines that had sunk in the 60s. He made a deal with the Navy that if he manages to find the submarines, they will fund him in his expedition to find the lost Titanic. And this is exactly what he did. He managed to find the submarines with 12 days left and then went on to find the Titanic afterward. According to scientists, a new rust-eating bacterium named Halomonas Titanicae is consuming the Titanic and it is predicted that within the next 20 years, it will consume whatever is left of this ship. Originally, there was a lifeboat drill that was scheduled to take place on the very day the ship hit the iceberg but because of an unknown reason, it got cancelled. At the time of the sinking, there was a ship nearby named “The Californian”. 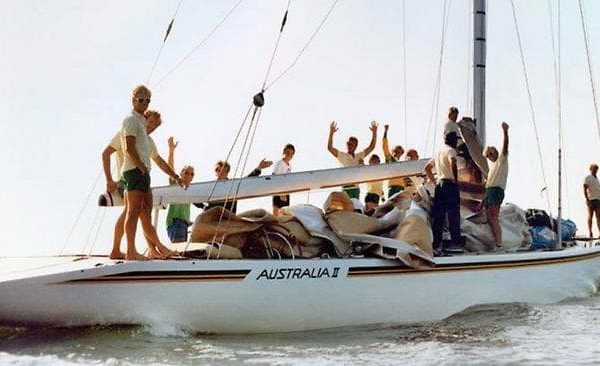 It could have helped in rescuing and probably saved a lot more lives if the communications had been working properly. Surprisingly, there weren’t enough lifeboats for saving all 2,200 people on board, and what’s even more surprising is the fact the lifeboats that were launched weren’t even filled to the maximum capacity. If they were filled till the maximum capacity, then around 1,178 people could have been saved, which is a lot more than the 705 who did service. The iceberg that hit the Titanic was a journeyman itself as it journeyed the oceans for around from the year 1000 BCE. In fact, the Titanic is the only ship ever to be sunk by an iceberg. She was just 2 months old when she boarded the Titanic along with her family. After the ship sunk, Millvina, her brother, and her mother were placed on the lifeboat and were saved. Millvina eventually died in 2009 at the age of 97 and was cremated, and her ashes were scattered from Southampton docks from where the Titanic set sail. Masabumi Hosono was a Japanese civil servant who was the only Japanese passenger on the ship. 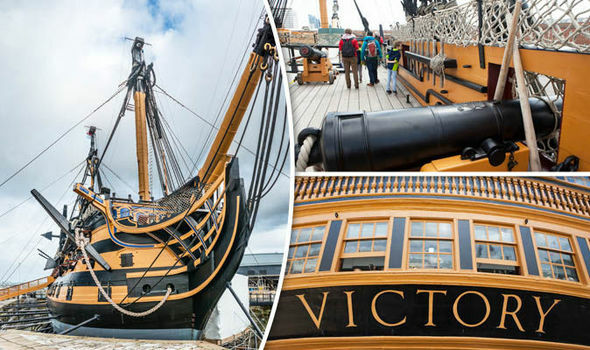 Even though he miraculously survived the ship’s sinking, he still found himself being condemned by the press, government, and the people as he was being called a coward for not going down with the ship. 12. The cost of the film “Titanic” is more than the Titanic itself! According to the research, the Titanic cruise ship would have cost around $195 million if it was to be built today. 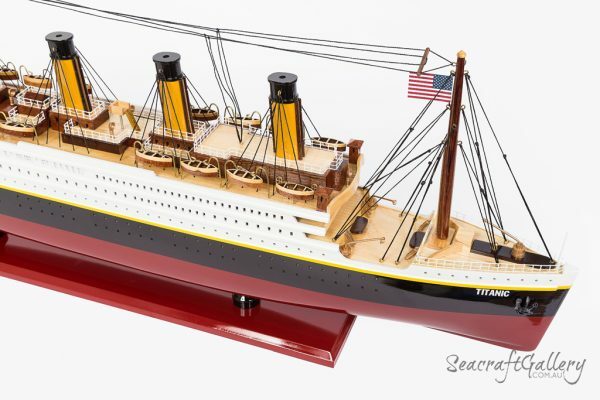 The Academy Award-winning Titanic managed to earn $2.2 billion worldwide – enough to construct 11.2 complete replicas of that ship! 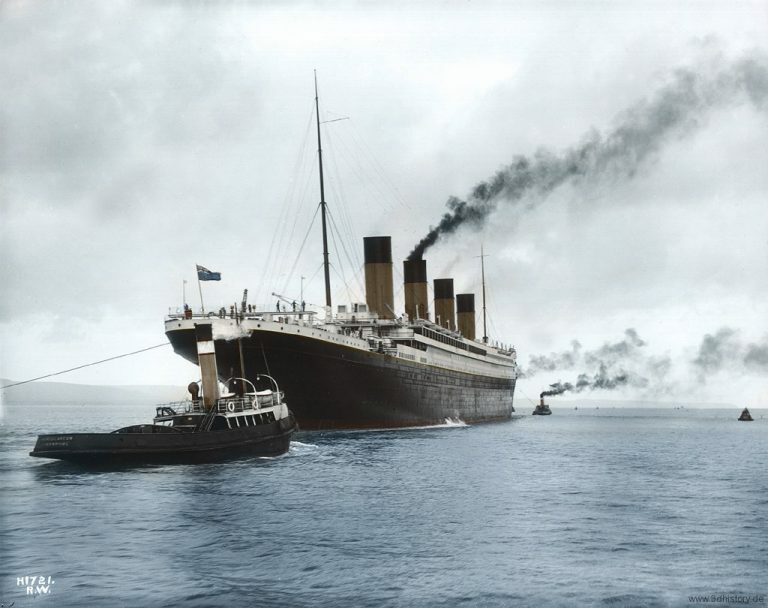 Throughout the history of mankind, there have been certain incidents that have been marked for eternity and the sinking of the Titanic is one of them. 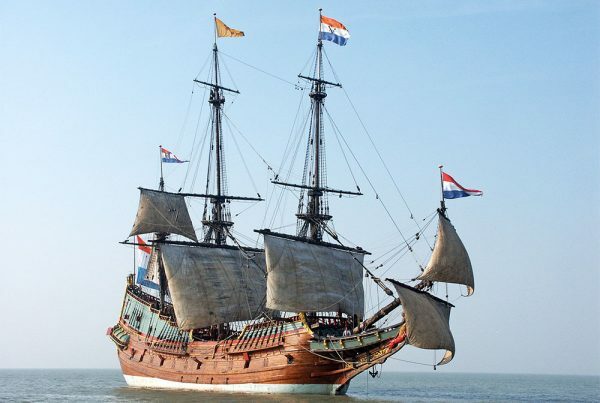 No one had imagined that a ship of such royal stature can sink, that too because of a few miscalculations. A lot of people wonder what could have been had the safety of the people on-board been taken more seriously or if the second officer wasn’t assigned to another ship or if they had spare binoculars with them to prevent the tragedy. A lot can be pondered upon but it cannot change the past. These days, incidents like this have become minimal as ships are well-prepared with radar and other technologies. But the event concerning the Titanic must never be forgotten as it was one of the mightiest ships ever built, which met with a tragic end. 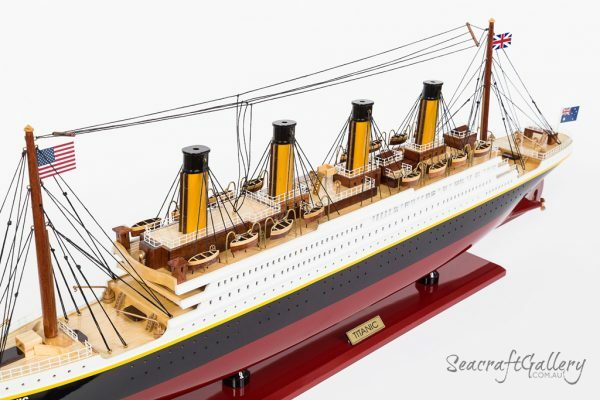 Seacraft Gallery is a leading supplier of handcrafted wooden model ships and boats. 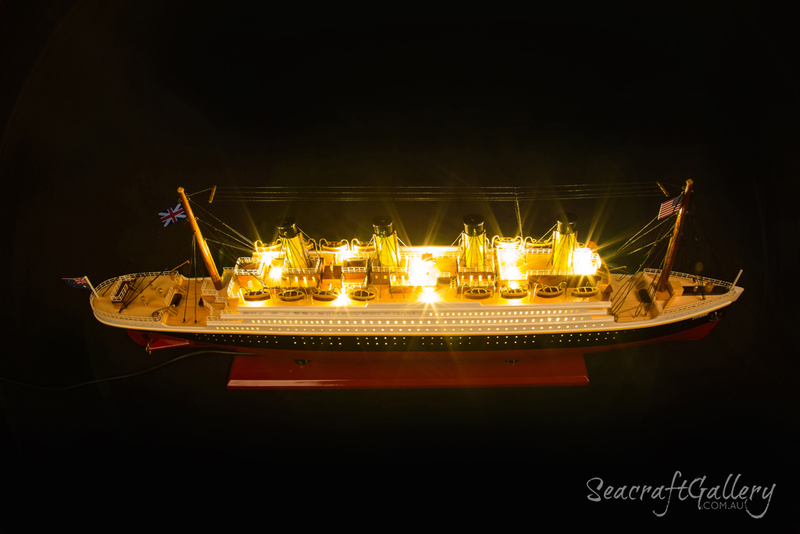 We have museum-quality RMS Titanic model ships in variable sizes 60cm and 80cm without lights and with LED lights. Contact us today for your inquires!